A few days ago, I celebrated my 19th birthday without my parents. No, I am not an orphan. But the conflict in Indian-occupied Kashmir (IoK) has ensured I live like one. I was born in Srinagar. My father, Dr Ashiq Hussain Faktoo, spent nine years in prison before I was born. He was briefly released and then arrested within months of my birth. It has now been 19 years that I have not seen him under the open sky. He is one of Kashmir’s longest-serving political prisoners, having languished in jail for 25 years now. Sometimes I want to tear the prison down and carry my father home. He is my father, but the occupation has laid its hands on him so strongly that I feel hesitant in calling him mine. He showed me his back once; scarred from severe torture. When I touched them, I felt like I was reading a horror story I was also a part of. I wanted to be brave like him, for he was my Superman and those scars knitted together formed a cape. 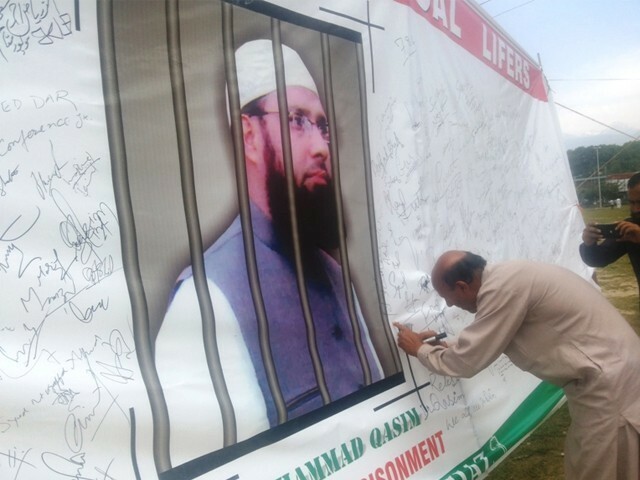 My father believes in a life of dignity for the people of IoK, and chose imprisonment over slavery. Prison became his only home, and my mother’s second home. They keep her in a different prison; at times they release her for a month or two and then arrest her again. My mother married my father because they shared a conviction and a cause. Strange how this struggle for a free Kashmir, that only tears people apart in life and death, ended up leading them towards love. My father was arrested in 1993 at the Srinagar Airport, along with my mother and older brother, Muhammad, who was a few months old at the time. He spent six months in prison, making him the youngest political prisoner of the Kashmir conflict. India accused my father of the murder of Hriday Nath Wanchoo, an activist documenting the crimes of the Indian state in IoK. My father denied the accusations forthrightly. Failing to come up with any substantial evidence for his involvement in the crime, he was tortured relentlessly. He was hung upside down. At night, they used to put rats in his trousers. This was all done in front of my mother’s eyes, all done to frame a man and ruin his life. He was coerced into signing a blank paper. Prison guards used to take my parents to torture cells leaving behind Muhammad, an infant. The only time I have ever witnessed my father cry was as he told me how he saw Muhammad playing with the faeces on his diaper after they returned from the torture cell. Hung upside down, naked, body bruised with a pistol on his head, they took his confession. Seven years later in 1999, he was released on bail and in the winter of that year, I was born. My brother says he thought I was the lucky son, for my father was home with me. I was – for three months. Then they arrested him again. I have no memories. I have no family photographs. All I carry today from that time is a void. My father was acquitted in July 2001; the courts recommended his immediate release, but justice is the last thing on the mind of a tyrant. He was then given life imprisonment set at 14 years, then stretched to 22, and later to death. He made prison his home, and my family and I made that hope our home. My father did not cry foul; he never calls himself a victim, for he is a fighter. He completed his PhD in prison, and has authored over 20 books behind bars. The people of IoK call him the Nelson Mandela of Kashmir. I just hope he too is a free man one day in a free Kashmir, for without a free Kashmir, his own freedom remains elusive. Bleeding, wounded and at the brink of death, my father smiled. In my father’s absence, she raised us alone. When both of them were imprisoned, we lived as half-orphans; as proud but shattered children, for our parents gave up their azaadi for the much cherished azaadi of their Kashmir, setting their conscience free. I hated parent-teacher meetings in school, as most kids do, but my reasons were different. I did not have my parents to accompany me. I felt like an orphan even when I was not, and at times when the anguish was unbearable, I selfishly wished I was one. It was raining the night they came to arrest her. The same rain that would have felt depressing without her felt so serene, but then peace and occupation can never survive together. She had to run. Her words pushed the tears from my eyes. How could she still be worried about us, our comfort? He nodded with a lump in his throat. She jumped over the wall; she had escaped. I stood there with a blank heart and mind. I was happy she was not home anymore. The air I inhaled was filled with despondency. I remember one of the rare times my mother was at home. I had topped my class in my final exams. I wanted to make my mother feel she has nothing to be guilty of; that she has raised a good son. I held my result to my chest and ran all the way home, but then the sight of the police vehicle brought me back to the world I was so used to. I saw her cuffed. I was breathing heavily. She saw me from a distance. The sun was blazing, but all its light could not pierce through the murk that surrounded me at that moment. They took her, just like that. I looked at the result, and I remember shredding it to pieces. That pain made those few steps home feel like a mile-long hike to the highest hill. I did not call it home anymore. It was an orphanage, a frightening mirage. My brother and I lived there – alone. I miss my mother. I miss her voice. She calls me once in 43,800 minutes from the prison phone for 120 seconds. I know it is just two minutes every month, but then I wish I could explain to her how every second of feeling the motherhood through her voice is priceless. She used to sing a lullaby to me on my birthdays. My mother is a wonder-woman. She smiles at me through the bars of the prison. She is a patient of arthritis and the doctor recommends she sleep on a soft bed, but she sleeps on the cold and pitted floor of the Tihar jail. With a broken back, worn out heart and a room as empty as her fate, my mother went on to become the mother of every child in a conflict zone. Hope is an intriguing phenomenon when you live in a conflict zone. Pain is the norm. Funerals take place every day. Children carry coffins more often than they do schoolbags, and the coffins carry children. I look at those children who are orphaned, and those who spend their birthdays in graveyards. I may not have my parents beside me, but I have some comfort. A comfort I cannot touch, but surely feel, for they are breathing. My mother is not beside me, but my memory may make her smile. So, I choose to hope. We will be together someday. She will sing me a lullaby one night, but until then – she is fighting to ensure that there is nobody who can ruin that night for my family or for me – for Kashmir. This literally broke my heart. I hope and pray that your prayers are listened soon and you are able to live with your parents in a free Kashmir.